I won two sets of the Guide Lines stamps (Papertrey Ink) off of ebay and have been having so much fun making my own backgrounds. Here are two fall cards I did using Guide Lines Two set. I embellished the inside with dictionary page leaves and verses. Both cards are so elegant, The embossed dictionary leaves are such a stroke of genius. The font/scripts are outstanding and your backgrounds ROCK. Praying you have an awesome day filled with joy. Thank you for joining our 148th challenge. Carole and the DT team at Word Art Wednesday. It's gorgeous! It looks like it took forever to do with all the color changes, but it's absolutely perfect for fall! The "Blessings" card is my favorite!! Loving the fall cards and you do such an amazing job making awesome cards!! Your stamped backgrounds are fantastic! I really like the colors you used. Very pretty! So glad you shared your creations at The Paper Players. Love that background, and the news print leaves are a fun idea. 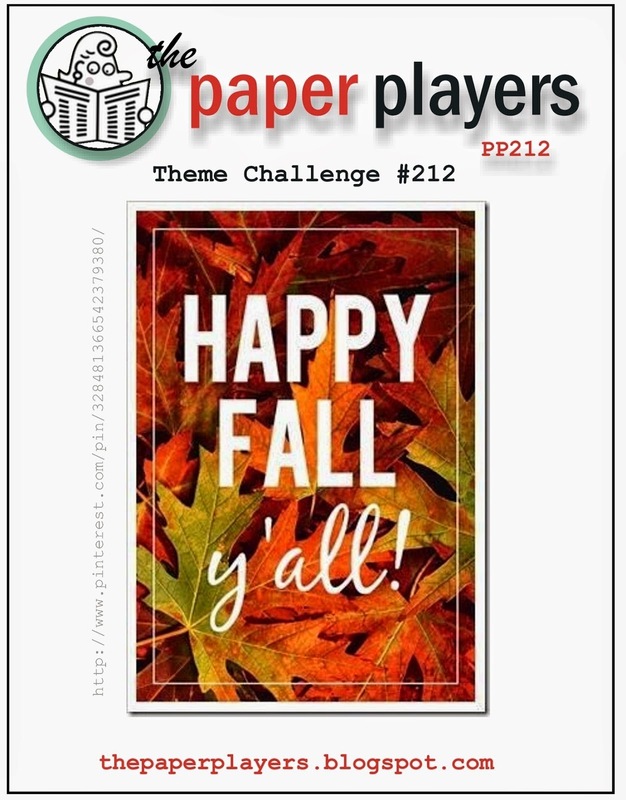 Thanks for playing along at The Paper Players this week! Lovely cards! Those backgrounds are fabulous, and the insides too! Thanks for joining us at The Paper Players. Two beautiful fall cards, inside and out! Thanks so much for joining us at The Paper Players this week! Wow, these are both beautiful...what gorgeous images and backgrounds! Thanks for sharing this with us at the Paper Players this week! Both of these cards are pretty...Wonderful colors! We appreciate you joining us last week and would love for you to play along with us again this week at Word Art Wednesday. Leaving you with God's Word in Hebrews 12:2---"Let us fix our eyes on Jesus, the author and perfecter of our faith, who for the joy set before him endured the cross, scorning its shame, and sat down at the right hand of the throne of God." Hugs and blessings! Absolutely STUNNING work, my dear friend. Thanks for sharing with us this week. I greatly enjoy having you play along with us.